Sistema Host Review 2019: Is Sistema Host a Good Hosting? 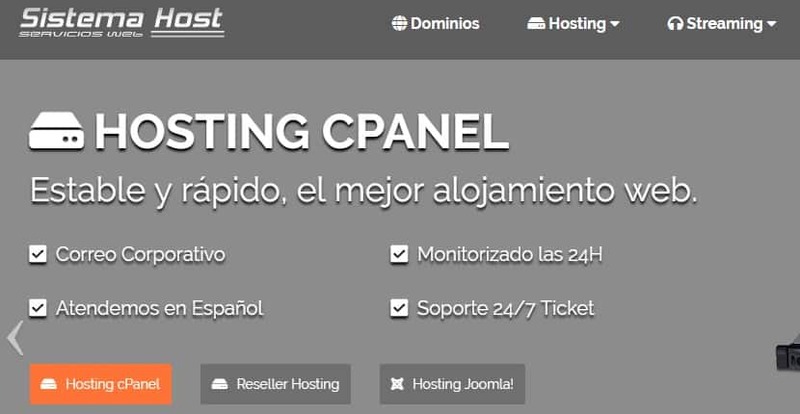 Sistema Host began their operations as a Spanish web hosting vendor in 2012. They present themselves as a young and dynamic brand that takes a forward-looking approach to the provision of hosting services to individuals and businesses in Spain. Founded in 2012, Sistema Host has been recording steady growth in the Spanish web hosting space with their forward-thinking approach to web hosting. The company has partnered with reputable data centers located in Spain, France, and the Netherlands. They present themselves as a young and dynamic brand with the expertise and passion to offer high-quality web hosting services to individuals and businesses in Spain and beyond. The Sistema Host website is only available in Spanish at the moment. Sistema Host’s web hosting packages also come with a 99% uptime guarantee, backed by the brand’s powerful Intel servers as well as their excellent fiber optic connections. This is the vendor’s way of assuring their customers of exceptionally low latencies and fast speeds. Apart from that, this Spanish vendor carries out round-the-clock system monitoring to make sure that no attack or hacking attempt succeeds. They also safeguard their hosting resources from misuse. All of Sistema Host’s plans allow users to manage their services by giving them total control of their websites via an easy-to-use control panel. You’ll also find a system performance monitor that shows you real-time information regarding your website uptime. Plus, you get instant configuration and account activation, so you can get started as soon as your order is validated. I was particularly impressed by the apparent redundant protocols that this hosting company employs in their server infrastructure, ensuring that their customers enjoy high server availability throughout the year. Sistema Host’s plans are all reasonably priced, particularly for the European market. Compared to other vendors in this space, Sistema Host stands out because their prices are competitive, yet their hosting plans are packed with a variety of features that webmasters would love. Sistema Host mentions no money back guarantee, however. Also note that all prices on their website are in Euros. Sistema Host has made available several ways through which customers can contact them, including phone, email, and a ticketing system. The ticketing system is available 24/7, but their telephone hotline is only available during extended office hours. The Sistema Host website doesn’t have a live chat or a knowledge base presently. However, the vendor tries to answer the most common user queries through the FAQ section on their website. I used their ticketing system to seek clarification about the many features in their hosting plans and what other information they could provide to help me make an informed decision. The support team responded after a while, and I wasn’t entirely satisfied by their response; it seemed they expected users to be fully familiar with all the technical jargon of the hosting industry and weren’t great at providing simple, beginner-friendly explanations. All the same, the support team was courteous and did their best to understand and provide answers to my queries. The long list of features that Sistema Host presents might capture the attention of many users, but the lack of details about these features leaves a lot to be desired. The vendor seems to require users to take a leap of faith, believing that the features included in their hosting plans will exceed their expectations. Users who value transparency in a host might find it hard to take Sistema Host’s word for it. Wondering how Sistema Host stacks up against other Web Hosting companies? Enter any other Web Hosting company and we will give you a side-by-side comparison.